When Howard talks about the desert, he shifts sideways slightly in his seat and looks out into the distance. It is as if he leaves the room where we are talking and is immersed for a few moments in the sights and sounds of the remote Australian outback. We are sitting around the kitchen table in his comfortable Victorian farm house. Two empty tea cups stand to one side. Spread out on the table is a huge laminated map of Australia. He is pointing out the route we and eight others will take in two weeks time, and as his fingers pass over the names on the map he frequently pauses to tell me more about the places the names represent. Howard is a very experienced outback traveller. His first trip to the desert was in 1989 when he was in his early thirties. He and another local man decided to take off to see the Red Centre of Australia. He admits he was very green at the time and had hardly been outside of Victoria. He was totally unprepared for the vastness of the country he was to travel and the impact it would have on him. He’s traveled back many times since, crisscrossing the interior of Australia in his four wheel drive. I’m left with the impression that Howard fell in love on that trip, in love with with the remote desert spaces in the centre of Australia. His fingers trace our route from Deans Marsh to Hahndorf, our first stop. Then North to Peterborough and on to Marree where we will take the renowned Birdsville Track. Turning left at Birdsville, we will head for Poeppel Corner where three Australian state lines meet. Every place out here has a story. Howard pauses, and then almost reverently says “And here’s the Simpson.” He stretches out his hand and covers first the desert and then our home state of Victoria. “Look, it’s as big as Victoria, and there’s not a soul living in it.” Later I Google this to see if it’s really true. I find that the Simpson Desert official area is about two thirds that of Victoria, but if you add in the surrounding area that is informally included when people talk of the Simpson, Howard is right. The Simpson is about the size of Victoria! 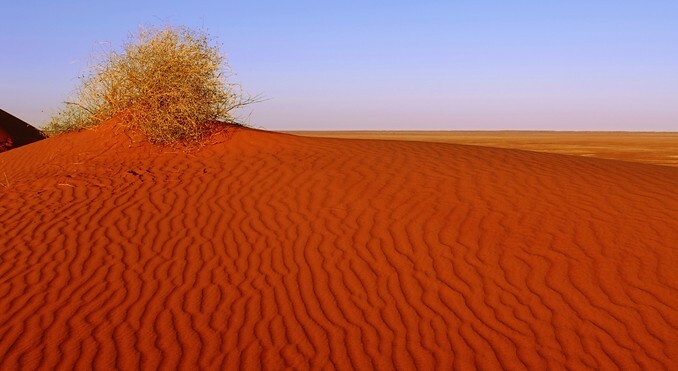 For overseas readers, let me help you imagine what this means so that you can visualise the scale of this desert. It is officially 145,000 km sq (56,000 sq mi). That’s bigger than the whole of England, which is only 130,000 km sq (50,000 sq mi). Imagine then that no one lives in the Simpson (although some indigenous folk live around the periphery), while England has 63 million inhabitants. I ask if we will see many other vehicles when we are crossing the Simpson? “Last time I crossed it I saw about 12 other vehicles over 4 days. That was 13 years ago, so it will be a lot busier now. We will probably see 3 or 4 times more. It’s busiest in the winter months of June to September, especially in Australian school holidays, but we are early in the season, so it will be reasonably quiet.” This sounds like a massive understatement for one of the most remote places on earth, but I know what he means. We are crossing the Simpson East to West on the French Line, a track created by a French oil company in the sixties to open up the desert for prospecting. Fortunately no economical mineral deposits were found and the desert was left in peace, but with an access road used by many 4WD explorers today. 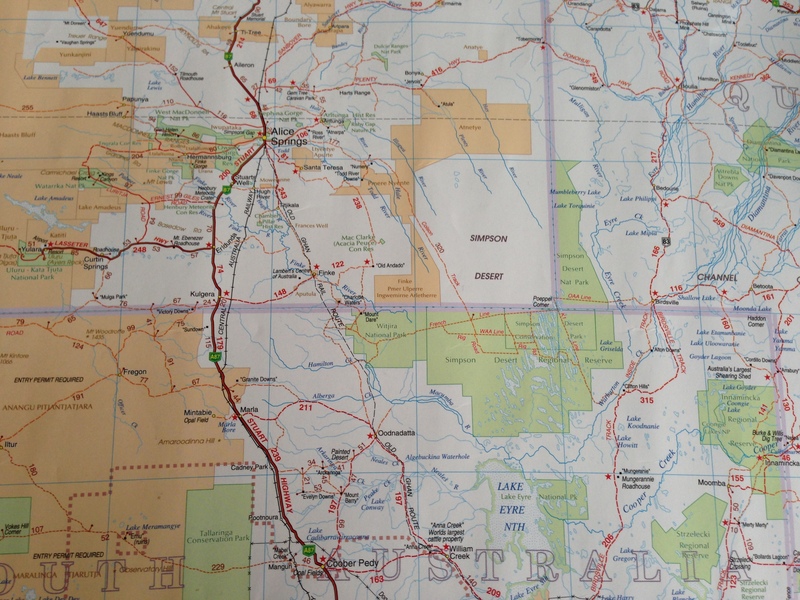 Howard points out the waypoints from the French Line on the way to Alice Springs, where we will join the Stuart Highway, passing through Mount Dare and Old Andado. Every place has a story, but this is already a long post! 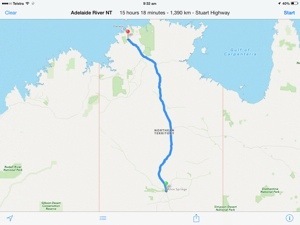 Once we reach Alice Springs and the highway, the stories peter out and with a swoosh of the hand Howard indicates that the remaining 1390 km to Adelaide River will be a straightforward couple of days highway driving. To an English ex pat the distances are mind boggling. Overall we will be driving around 4000 km in 13 days. That’s the equivalent to driving from London to the North Pole or New York to Calgary. It’s a hell of a long way, but this is Australia. Long distances are shrugged off with a larrikin smile and a wink. No worries, mate. This entry was posted in Getting ready to go, Howard, Route and tagged Australia, Outback, Simpson desert, Travel on 06/05/2014 by Deb McSephney. Excellent commentary I two have sat around with Howard and Bear and my heart has stirred even reading your article a tear rolls down my face as your adventure is about to begin. My fist journey out to the out back was inspired by Howard and Bear also my being a bit different because l could only stick to the roads but l went out in a Honda prelude my boot packed with all the essentials like yourself tent burner minimal food snacks and a portable fridge that sat on the front floor. Let me tell you how l fell in love with it about 60ks out of port Augusta you will feel it, the land becomes alive and you feel a energy that speaks to every part of your being on a different level. It is truley amazing the colors the sight the animals you will encounter you are blessed to be traveling with the Bushes. Your whole spirit will stir as you become one with the land, tune in in the different energies an places you will encounter, as the dreamtime will speak to you and your own story will emerge. Will be following you guys closely maybe even in comming years will be able to hook up and do a trip myself with us all out there . Hi Sally, I admire you for setting out in a Honda Prelude to see the red centre. These days it’s hard to imagine when so many of us drive 4WD vehicles on a daily basis. Thanks for your kind wishes. We are lucky to be travelling with such an experienced group of people and I know we’ll learn a lot from them. I look forward to taking you on the journey with us through the Big Red Bit blog. We wish all of you a safe and happy trip. Wish we could join in on the adventure, but look forward to reliving it with you on your return. When we look up into the night sky in Deans Marsh we will think of you looking up from the Simpson Desert. Thank you Kathy and everyone else who has wished us bon voyage over the past few days. We are finally almost ready to go. At 8:50 PM on Friday evening, we have only a couple more tasks to do before we leave at the crack of dawn tomorrow morning. The adventure begins!